Welcome to Blawg Review #94--the "getting to yes" edition! Many editions of Blawg Review are organized around a central, unifying theme, influenced by the focus of the host's own work or an event or date that edition coincides with. The theme of this one happens to be negotiation. Why? I'm a mediator. And as a mediator, I help people negotiate. Consequently I spend a lot of time thinking about negotiation and how people go about it. Negotiation also is something that just about all of us do, every day and sometimes all day long. The problem with negotiation is many of us know only two ways to do it--1) the competitive approach where I win and you lose, or 2) compromise where we each give a little and get a little and we both walk away equally unhappy. In both cases, we leave value on the negotiating table when we walk out the door. There's also an ages-old tension between getting the best deal possible and maintaining a relationship with other side. We often assume we can't have both. As a framework for negotiating, Fisher and Ury's work yields seven elements critical for negotiation success: interests, options, alternatives, objective criteria, relationships, communication, and commitment. These seven elements will serve as my focal point for this edition of Blawg Review, and the posts I'll be covering are organized around them. Please join me in getting to yes with Blawg Review. Okay, so technically this is not one of the seven elements of negotiation. I was just seeing if you were paying attention. Besides, did you really think I was going to forget to mention this most sacred of all American institutions, especially since this edition of Blawg Review was put to bed just hours after the Super Bowl ended? Hey, I may be a mediator, but I like competitive contact sports as much as the next person. The American Constitution Society Blog examines "Super Bowl XLI, Breaking Down Barriers in the NFL, and the Legacy of Fritz Pollard". The Strategic HR Lawyer muses about workplace absenteeism on the Monday after the Super Bowl (although it's tough making excuses to the boss when you're self-employed like I am). And Overlawyered in "The Big Game" explains why advertisers aren't referring to the Super Bowl directly by name--it's just as you suspected--it's the lawyers' fault. In addition, Evan Schaeffer's Legal Underground presents The More-Entertaining-Than-The-Super-Bowl Edition of the Weekly LawSchool Roundup. And Marty Schwimmer at The Trademark Blog asks, "Can You Watch The Super Bowl On a 70'' Screen In A Church?" For my international friends, the Atlantic Review pokes gentle fun at American exceptionalism in sports in "America is expected to win the Super Bowl". (Speaking of which, baseball fans like myself have often wondered why it's called "World Series" when only America and Canada get to compete.) Also included is a link to information on how American football works. Now let's get serious and take a look at the seven elements of negotiation. In traditional, hard-bargaining negotiation, we take positions. And positions can only be met in very finite and limited ways. You can accept. You can reject. You can compromise. That's it. There's not a lot of room for creativity. Fisher and Ury, after studying and participating in thousands of negotiations, realized that there was a way to get around the self-limiting nature of traditional bargaining. By getting people instead to look at interests--the needs underlying their demands--whole new avenues of options for meeting those interests open up. You need of course to understand your own interests. If you're not clear about what you want, you won't be able to figure out how to get there. You also have to understand the interests of your counterpart on the other side. By understanding their interests, you can figure out how to motivate them to reach a deal with you. Interests matter in important ways in all our important interpersonal interactions. For example, if you're providing a professional service, understanding your clients' interests will make you better--and more competitive--at providing that service. Speaking of interests, Carolyn Elefant at MyShingle.com has this advice for lawyers: "What Do You Do If Your Clients Want to Lead A Revolution? Join Them, Of Course!" Lawyers and other professionals have an interest in being as productive as possible and using tools that can help them get there. George Lenard at Employment Blawg shares his experiences with "My favorite productivity tool: voice recognition software". Colin Samuels at Infamy or Praise ponders optical illusions--contract terms that are little more than a "fun-house mirror" and asks whether these truly serve a client's interests. Dan Hull at What About Clients?, the blog that keeps the focus on clients' interests, wonders "Do you run a belief tank?" and points to a post at Spare Room Tycoon that asks the hard questions about what it means to be a lawyer in service to our clients. In "Chew out your lawyers, get sued for defamation" Overlawyered points to a case that illustrates the misfortune that results when clients fail to get their interests met--and when a firm responds the only way it knows to client frustration. While sometimes we encounter problems that are impossible to resolve (and nailing Jell-O to the wall is apparently one of them), generally speaking by working together we can come up with pretty creative options to solve them. Whether you're a lawyer or a mediator, chances are you're often on the lookout for options that will meet your digital age needs. Lifehacker has two: "26 tips for optimum computer functionality" and "Download of the Day: Create better passwords with Pwdhash". From the TechnoLawyer Blog comes Dennis Kennedy's review of Bluebeam Software's Bluebeam PDF Revu, a "complete PDF solution," which allows users to view, create, edit, and comment on PDF files, and also convert any file to TIF, JPG, GIF, BMP, PSD, PNG, EMF, WMF or PCL. Last week my 20-year-old son had the negotiating lesson of a lifetime. He missed a return flight to the U.S. at an airport in Bali. It was almost midnight, and the airport was about to close. He needed to get a cab back to the hotel where he was staying with friends. Only one cab was left, and the airport was starting to look like a pretty lonely place. The cab driver demanded $100 to take him to his hotel. During his conversation with the cabbie, no other cabs appeared. My son was alone in a foreign country and had no way to contact the people he'd been staying with to arrange a ride from them. My son tried to negotiate with the cabbie and in the end accepted the final demand of $80. Why? He had no other alternatives. In seven more hours, the increased number of cabs arriving with the daylight would have given him plenty of alternatives and he could then have easily walked away from the cabbie's demand. In fact, the existence of other alternatives for my son would have given him leverage and forced the cabbie to come down on his price. Alternatives are clearly important in any negotiation. They help us decide whether to accept or reject an agreement, giving us power and strengthening our hand. So good negotiators spend time developing or considering their "best alternative to a negotiated agreement"—or BATNA for short. Sometimes that alternative may be litigation. Let's therefore take a look at some posts this week relating to courts, judges, and trial. According to Eric Turkewitz, who publishes the New York Personal Injury Law Blog, "mediation may be efficient, but you miss the heart-pumping excitement of trial". You can see for yourself in Eric's post, "Scooter Libby Trial - A Truly Bizarre Trial Experience", in which he recounts how one observer suddenly hears the testimony is about him and it isn't in accord with his recollection. Meanwhile, Ford Vox, M.D., who blogs at Future Logic Markup Language, attended the ACLU vs. NSA federal appeals hearing in Cincinnati. In "Freedom from Government Surveillance" he reports that the Government's lawyers have evidently been reading too much Franz Kafka. Glenn Reynolds at Instapundit has some "Good News for the Blogosphere" with an announcement of a California court's ruling protecting online journalists from revealing their confidential sources. The California Employee Rights Blog tells readers " Why Wal-Mart Employees Should Consider NOT Accepting Settlement". Just in case you're heading for litigation, Evan Schaeffer helps you get ready to avoid the "Two most common deposition errors" at his Illinois Trial Practice Weblog. Carolyn Elefant at Law.com Inside Opinions looks at the "The Role of Wikipedia in Judicial Decisions". Meanwhile, mediator emeritus David Giacalone at shlep: the Self-Help Law ExPress reports on a "Judge recused for dissing pro se gang defendants". What's the size of your ecological footprint? According to the Legal Writing Prof Blog, an Arkansas Court of Appeals judge may have been pondering that very question: he wants to institute electronic appeal procedures upon calculating that in one appellate case, the case's record and brief consumed 25,399 pieces of paper--the equivalent of three trees. Concurring Opinions asks, "Where's "Fair & Balanced" When You Need It? Odd News Coverage Gaps at www.scooterlibby.com". At Opinio Juris, Julian Ku notes the International Criminal Tribunal for Rwanda's mad scramble to clear its caseload before its mandate ends next year in "The ICTR Enters the Fourth Quarter Down by Two Touchdowns." Diana Skaggs at Divorce Law Journal discusses "Lawsuits Against Airlines: The Latest Effort To Stem International Child Abductions". Finally, Jonathan D. Frieden explains how even courts rely on mapquest posted at E-Commerce Law. How do you know if something's a good deal? Objective criteria provide standards for ensuring fairness at the negotiating table. For example, in salary negotiations between a school committee and a teachers' union, data on what teachers in similar school districts are earning can establish a yardstick for determining a fair increase in compensation. Speaking of salary, Allison Shields looks at why "Associates Would Give Up High Salaries for Lower Billable Hour Requirements posted at Legal Ease Blog. According to Allison, "It's mind-boggling that so many lawyers, (and many of the consultants who advise them) still assume that in order to be an excellent lawyer, you have to work a ridiculous number of hours. The number of hours you bill doesn't determine how good a lawyer you are, and it certainly doesn't have any direct correlation to whether you provide your clients with excellent service or not." How much work is simply too much? The HR Lawyer's Blog considers The Culture of Extreme Work and its unsurprisingly negative impact on employees and organizations. In "200,000 SqFt; Hi Flr; Park Vu", Bruce MacEwen at Adam Smith, Esq., discusses when large, expensive leased offices are appropriate investments for firms. To say that communication is critical in negotiation is stating the obvious. But no matter how important we know it to be, we still have a tough time getting it right. With respect to communication, Fisher and Ury observed, "Statements get resistance. Questions get answers." In negotiation it's important to think carefully about what you say and how you say it. For a great example of why we need to think more carefully about the messages we convey, Jeremy Blachman muses over Joe Biden's ill-considered remarks last week that Barack Obama was "articulate" and "clean". Robert Hyndman points to some smart advice at "Ask the VC" which can serve anyone well: "The most important part of being a venture capital lawyer is being a good listener with sound judgment and having a good relationship with the entrepreneurs, along with the requisite experience. Make sure with whomever you choose, that you see them as a true partner, not an hourly paid servant." Good idea for anyone, even if you're not a venture capital lawyer. Tammy Lenski over at Mediator Tech gives her review and a big thumbs up to "Grand Central: A Phone Solution for Small Business" and also has advice for anyone trapped in phone menu hell in "Get Human When You Need Help". In "Trademark suit threats to shut down free speech? Shocking," Ron Coleman at Likelihood of Confusion clears things up in a dispute over a parody web site. In "Lawyers as Writers," Ken Adams at AdamsDrafting with honest self-reflection discusses how tenacious is the notion that we, as lawyers, are good writers--a notion that is difficult to move past despite mounting evidence to the contrary. Michelle Golden at Golden Practices, however, comes to the rescue with advice on writing at "Good Writing. Bad Writing." Language Log looks at "Taboos of the Nation" and the difficulty in discussing taboo words on a radio program without actually being able to say them in the days of tough enforcement by the Federal Communications Commission (caution: post contains sexually and ethnically offensive words). At Balkinization, Jack Balkin shares his "Interview on Blogging and Legal Scholarship with Yale Law Report" in which he discusses the state of legal writing. Speaking of blogging, in "John Edwards' blogger-in-chief cleaning up past blog record" Kevin O'Keefe at Real Lawyers Have Blogs reminds bloggers that blogs leave a trail, which is a good thing: "Unlike a seminar, article, or newsletter, your thoughts, insight, and commentary on your niche area of the law are recorded and retrieved by folks looking for relevant information." But bloggers must also be willing to stand behind what they say--or risk losing their credibility. If all else fails, follow the advice of Gruntled Employees: "What would Jack Bauer do? Use plain English". Relationships are important to negotiation. Why? Consider this. After all the energy you've spent negotiating, which would you rather have? An enemy who'll tell the world not to do business with you? Or a repeat customer or client who will send more business your way? Relationships are also about trust. You don't have to be trusting, you just have to be trustworthy. You need your counterpart on the other side to work with you. And if they trust you, they will talk about their interests. If you know their interests, you can propose options that will get them to yes. Victoria Pynchon at the Settle It Now Negotiation Blog looks at recent findings by neuroscientists that suggest that engaging in small talk at the commencement of a negotiation is far more important than who makes the first offer. It seems that thinking about money before engaging in any activity tends to make us both selfish and withdrawn--a state of mind antithetical to the kind of collaborative problem solving that creative "pie-expanding" negotiations require. Jamie Spencer at Austin Criminal Defense Lawyer asks, "Are you an aggressive defense lawyer?" and makes the compelling case that good manners can go a long way in negotiating with the other side. In "Pork, Trademarks, and The Other White Milk" Mommy Blawger recounts the public relations hell the National Pork Board created for itself in sending a cease-and-desist letter to a breastfeeding mother raising money for non-profit milk banks through sales of t-shirts bearing the slogan: "the other white milk". Networking of course is a great way to build relationships. Duct Tape Marketing Blog Channel announces that today, February 5, kicks off International Networking Week. David Maister, incidentally, clearly understands the importance of relationship-building with readers. He begins his post on "Business Development in Professional Businesses" with the following warm words of encouragement to his readers: "Here's another email question I received. (By the way, I LOVE receiving them — it ensures that I blog about real-world topics of interest to at least ONE person!!)" Arnie Herz, who reflects thoughtfully and often on the importance of relationship-building for lawyers, offers discussion and links on "more on mutuality in business relationships" at Legal Sanity. The big news of the week in antitrust circles was the move of about 20 attorneys from Cadwalader to Skadden, rival firms. Not only is this a major addition to Skadden but it basically leaves Cadwalader with no antitrust practice. Antitrust Review features not just one but two posts on this. Also covering this story were the WSJ Law Blog and Above the Law. At Trusted Advisor Associates, Charles Green asks, "As more and more distractions vie for the attention of busy legal professionals, who is right about efficiency vs effectiveness: Drucker or Godin?" Using actual quotes from Seth Godin and Peter Drucker, Green envisions a panel discussion between these two business-world thinkers in which they debate multi-tasking. He asks readers, "Think about trust. Do you more trust a multi-tasker, or someone who totally focuses on you? 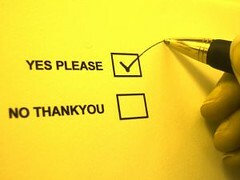 (Right answer: we trust those who multi-task most of their life, except when they're with us—when they pay attention.)" Many legal bloggers like myself were fortunate to have been befriended by Ian Best, who made blogging and law school history by becoming the first law student to get credit for blogging at 3L Epiphany. His opus included the painstaking development of a comprehensive Taxonomy of Law Blogs. Ian emailed his supporters last week to announce that he has transferred 3L Epiphany to the Law Professor Blogs Network, where it will appear under the new name "Law Blog Metrics." Please join me in wishing Ian all the best (no pun intended there) and congratulate him on his new job. Commitment means the agreement that results from negotiation--the commitments that each participant is willing and able to fulfill. Attention to detail is important--the more contingencies that can be anticipated, the fewer details left to chance, the more enduring the agreement can be. The devil as they say is in the details. There are several posts that illustrate the truth in this hoary proverb. In "Beware your employment contracts", Jen Burke at Transcending Gender points to a post at Decision of the Day about a court battle over millions of dollars in contingency fees involving a new lawyer who worked for a personal injury attorney without a written contract with her boss. And you thought misplaced commas cause problems: wait till you read what Ken Adams has to say about a "New Law Review Article on the Ambiguity of And and Or". We sign agreements to evidence our intention to be bound by their terms. Acrobat for Legal Professionals Blog has suggestions for "Creating a Transparent Signature Stamp" in Adobe Acrobat using your scanned signature. In interest-based negotiation, the ultimate objective is a win-win agreement for all parties at the table. Alas, Ted Frank at Point of Law sees a big lose-lose in a senate bill that eliminates punitive damages as a tax deduction for businesses in "That didn't take long: first Democratic earmark for trial lawyers". Sometimes the toughest negotiation is with yourself. In "Giving New Meaning To 'Careful What You Wish For'" Denise Howell at Bag and Baggage gives us a sobering reminder of the trade-off between professional and personal fulfillment and the perils of the billable hour. Want to be an effective negotiator? Come prepared. In fact, it's been said that skilled negotiators spend four hours of preparation for every one hour of negotiation. Before you arrive at the table, take time to identify your own interests and weigh your alternatives (your BATNA) so that you can negotiate from a position of power. Consider the other side's interests and alternatives as well. Give thought in advance to thinking about options that might satisfy your interests and theirs and that won't leave value on the table. Are there objective criteria to support what you're asking for? Give thought to the relationship you want to have, if any, at least for purposes of the negotiation (remember, don't be trusting, be trustworthy). And think about the messages you want to convey and how you want to convey them (communication). Finally, be prepared to put in work at the end of the negotiation nailing down the details of agreement (commitment) to make it as enduring as possible. Let your motto be, no value left behind. If you want a painless way to learn better negotiation skills, invest three minutes a week at Josh Weiss's podcast, Negotiating Tip of the Week. Josh's most recent podcast looks at "National Negotiation Styles" for the negotiator in international or multicultural settings, including traps to watch out for. Ellen Freedman at Law Practice Management takes a look at a very different kind of preparation in "Are You Ready for the Pandemic?". How prepared are you? Negotiators will sometimes turn to mediation for assistance with negotiations that have derailed or sputtered out. Although hard-nosed negotiators may view mediation as a sign of weakness, that's not what Blawg IT-Internet Patent, Trademark and Copyright Issues with Attorney Brett Trout has to say, according to this recent post, "Request to Mediate a Patent Case Shows Strength". So, do bloggers need mediators or maybe labor negotiators? As reported by the Legal Profession Blog in "Welcome Wagon: Securities Law Prof Blog. Empire Strikes Back", it looks like there's a labor dispute at the Law Professors Blog Network that could get ugly. As Alan Childress told me, "Maybe the law professor blogs should unionize and slow production down, but then there'd be management retaliation--not mediation--and the inevitable outsourcing to India. The end is not pretty." Only bloggers and management know if a win/win is possible. One of the cornerstones of mediation is confidentiality--which promotes candid dialogue and encourages parties to explore and reach settlement, secure in knowing that communications with the mediator are privileged. Speaking of confidentiality, although the identity of a number of anonymous law bloggers remains unknown, including the hard-working Editor of Blawg Review (known only as "Ed." even to his own mother), the Wired GC is unmasked in this photo taken last Sunday at a pre-launch party for BlawgWorld 2007 in New York City. Meanwhile, the Greatest American Lawyer tells readers, "I Have a Secret About Law Firms": "Having seen both sides of the practice, I have to say that one of the most fundamental flaws of hourly billing firms is the propensity to attempt to service more clients than is reasonably possible." The GAL also pauses to ponder "Those Who Came Before Me"--namely, those other great writers, Voltaire and Diderot among them, who produced work anonymously. And, at Volokh Conspiracy, Orin Kerr looks at the "New Ninth Circuit Decision in Ziegler", a case involving an employee's expectations of privacy in his computer at work, and concludes, "The new opinion gets it right: it concludes that the employee had a reasonable expectation of privacy in the machine, but that the employer had the right to consent to the government's search under third-party consent principles." 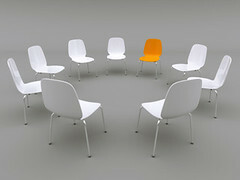 Occasionally in mediation parties will reach impasse in their negotiations. One technique that mediators may use to deal with this is to float the "mediator's trial balloon", in which the mediator proposes one possible solution that similarly situated disputants have utilized, and then asks the parties what they like and don't like about the idea. This gets more interests and options on the table and can reboot the negotiations. Trial balloons prove useful in blogging as well. Bill Sjostrom at Truth on the Market floats a trial balloon to seek reader comment on a piece he's developing on majority voting for the election of directors. People like me who teach trainings in mediation and negotiation rely upon all kinds of strategies to cover the material in the depth it deserves while at the same time honoring the demands of the clock. In any training, questions or issues arise that will either be addressed later in the agenda or the schedule doesn't allow time to address at that very moment. Many mediation trainers use a "bin"--a sheet from an easel pad taped to the wall--to jot down and keep track of questions to return to later on. Here's the Blawg Review #94 Bin--the good stuff that didn't necessarily fall into any of the categories above but is still deserving of our attention. If you were one of the many who weren't able to make it to this year's LegalTech New York, an annual event which bills itself as " the largest and most important legal technology event of the year", check out David Snow blogging at Law.com Legal Technology as he describes how LegalTech NY 2007 kicks off and gives us the wrap up at the end, while Common Scold Monica Bay provides her final observations in "WOW! IT'S OVER!" And if you can't get enough of conferences, geeklawyer.org has information on the UK Legal Blogging Conference. Who says taxes are boring? Professor James Maule at Mauled Again looks at unusual tax issues in "Taxing Ticket Takers and Rocketship Riders". Sean Sirrine at Objective Justice shakes his head over U.S. v. Hector: "First it was the knock-and-announce rule, now it is execution of the warrant...Seems to me that you're likely to get into a lot of fights between people and law enforcement if they aren't required to show a warrant. I know I wouldn't let them into my home." Conspiracy theories abounded at last week's edition of Blawg Review, hosted by Cyber Law Central. Paranoia must be contagious, since Brendan Loy at The Irish Trojan's Blog is convinced that J.K. Rowling wants him to fail the bar: the bar exam and the publication date for the final installment of the Harry Potter series unhappily overlap. In Florida, they're starting the revolution without us, according to RiskProf in "When Did Florida Elect Hugo Chavez for Governor? ", a criticism of a Florida bill recently signed into law that "nationalizes" the Florida insurance industry. At Inside Opinions, Robert Ambrogi sums up the latest reaction of the legal blogosphere and others over the new advertising rules that went into effect for lawyers in the Empire State in "Controversy Continues Over N.Y. Ad Rules". J. Craig Williams at May It Please The Court reports on news that should worry anyone who cares about the health of and access to U.S. federal parks in "Yosemite Park Faces Questions Over Public Use And Rehabilitation". Citizens react to their laws and they tell stories about it to one another. Frequently this extra-legal myth making ends up being more powerful than the legal doctrine that spawns it. Think, for example, of the power that stories about civil rights and judicial desegregation have over our politics, even (and perhaps especially) when those stories wildly exceed the legal doctrine itself. This hermeneutic fecundity is part of the power of the law. In this sense, judicial decisions probably call forth revelation and prophecy more frequently than we suppose. Thanks to everyone for your submissions, as well as to the kindly blawg sherpas who guided me along the way. My deepest appreciation goes to Ed., Blawg Review's dedicated and tireless editor, for trusting me enough to do this a second time, and to all of you for stopping by. And of course I wish you the best of luck in getting to yes in all your negotiations, both professional and personal.